Hand built engine using specially selected parts. Compression ratio reduced to 7.5:1 (standard 8.0:1). Smaller charger pulley to give a maximum boost pressure of 0.8 bar (standard 0.72 bar). Twin exhaust system using catalytic convertors. 5 speed gearbox incorporating an oil cooler and stronger 5th gear. 155/13 tyres running at high pressure to reduce rolling resistance. Front and rear bumper spoilers and other aerodynamic aids reducing Cd (drag) by 10%. Safety fuel tanks holding 22 gallons (100 litres) with twin quick fill fuel caps in the rear screen. 63kg of spares and tools as required by the regulations for repairs during the run. Running on Esso Super Unleaded (95 RON), the modifications gave the cars a peak power of 129bhp (DIN) at 6000rpm (standard 115bhp (DIN) at 6000rpm) and a peak torque of 160Nm at 4000rpm (standard 148Nm at 3600rpm). They were capable of a maximum speed of 133mph (215kph) at which fuel consumption fell to 15mpg (18.8l/100km). In the attempt the fastest car averaged 130.08mph (208.14kph) for 24 hours and covered the 5000km at an average speed of 127.75mph (204.41kph), easily breaking the existing records. Often these types of record attempt are made with cars using special bodies and engines that have little in common with the production car. Most manufacturers would certainly not include a catalytic convertor! 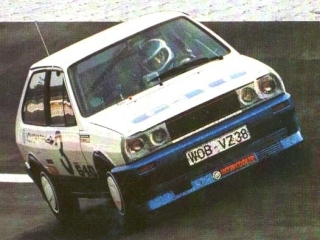 Despite the modifications described above, the record breaking Polos were very close to the production models that later became available. This was a delibrate policy by Volkswagen to demonstrate the performance potential and reliability of the new power plant. It is interesting to note that a production Polo G40 can easily be tuned beyond the power levels of the world record cars; all that is needed for your own world record attempt is a track where you feel comfortable taking the corners at 130mph!